This isolated peak is on the Fermanagh/Cavan county bounds and overlooks Upper Lough Erne. See Máire MacNeill, 'The Festival of Lughnasa' (pp. 174-75) for details of the festive assemblies at Tory Hole, a cave on the western slopes of Slieve Rushen, and on Ballyheady Hill, south of Ballyconnell. Slieve Rushen is the 919th highest place in Ireland. Slieve Rushen is the second most easterly summit in the Breifne area. Slieve Rushen is situated in both Cavan and Fermanagh. The county boundary – and boundary between Northern Ireland and the Republic – crosses Slieve Rushen, although it doesn’t come closer than 1km of the summit, meaning that the summit itself is in Cavan. Although only 404 metres in height, Slieve Rushen is a large hill, measuring about 6 kms at its widest, and 10 kms at its longest. Slieve Rushen has attracted all sorts of commercial activity, including wind farms, quarrying and forestry operations. I discovered a full size two lane tarmac road complete with central white lines running east- west at the 200 metre elevation mark, even though it is not marked on any OS map. This was clearly built for the heavy machinery driving around the hill. I discovered it at H23425 20139 A and I followed it east until it was blocked by a barrier at H26154 20501 B. I could only gaze at it disappearing into the distance ahead as I turned my car around. A warning sign written in both English and Polish was a reminder of the Celtic Tiger that would have brought so many workers to the commercial activity on the hill. There are several tracks running off the road which could give access to different areas of the hill. 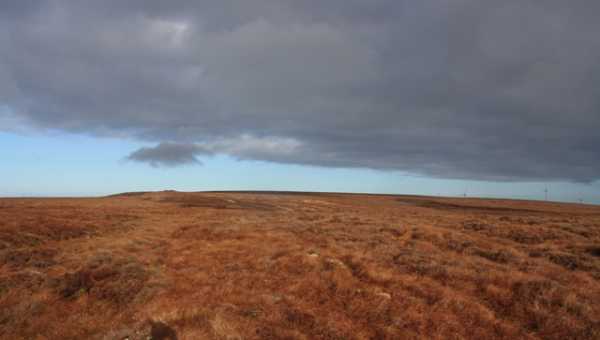 Despite all of the evidence of commercial activity, the summit itself is a pristine area of bog and heather, with no evidence of previous walkers. There aren’t even any animal tracks to help you through the sometimes difficult heather. I opted to park at H23164 21626 C and take a walk across the bog for about 1.2km to the summit. There is room for a few cars here, and there are a couple of wind turbines. There are no gates or keep out signs on the approach. The last few hundred metres up to this parking spot is a steep track. From here it is a case of heading NW over the bog to the unmarked summit. The ground is curiously spongy and it is slow going in places. It was freezing when I was there, and still soft, so I imagine it’s wet and difficult at other times. Slieve Rushen is a hill with no discernible high point, with a flat heathery summit unmarked by even a stone. There is a slight heathery bump about 80 metres north of the given MV grid ref which may be slightly higher than the surrounding bog, but I think a metre here or there wont matter to many.